Challah represents the idea of taking something physical and elevating it to the spiritual. 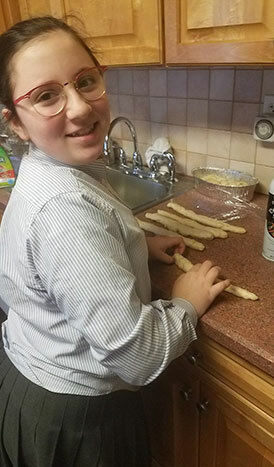 Not only are we providing physical nourishment to those who eat our challah, but they are also being nourished spiritually with the thoughts and blessings that we conjure up while we are making our challah. The aroma and taste of warm home baked challah is unparalleled. Making challah is a spiritual experience, and there are a great deal of blessings and insights in each of its ingredients. There are seven basic ingredients in a challah recipe; water, yeast, sugar, eggs, oil, flour, and salt. There is a special eighth ingredient that is unique to each and every one of us, and that is our souls. When we are making the challah we are putting our personal spiritual energy into the dough. As we add each ingredient we add a new blessing to our dough, which will enhance the spiritual influences. Whoever eats the challah also ingests these Divine blessings. Flour represents sustenance, not only our livelihood, but also our relationships with others. We pray that Hashem should bless us with a livelihood so that we could use our funds for the right reasons. We wish for Hashem to help sustain a relationship that might need some assistance and thank Him for the relationships we do have that sustain us. As we sift the flour we are sifting through our thoughts, speech and actions. We are removing the impurity and desires of the yetzer hara. We should request from Hashem to expel all the illness from Am Yisrael; to sift through our lives and remove any negativity. We pray that the only thing that is left in our “bowl of life” are all the positive influences and blessings. Water symbolizes life and Torah. Just as we cannot live without water we also cannot live without Torah. Water provides life-force and nourishment to all things. Therefore, it represents the attribute of chesed (kindness). As we add the water, we should think of something in our lives that we wish for Hashem to bless us with in abundant kindness and that it should flow down into our lives, just as water flows. We should also focus on having a happy life with berachah and hatzlachah; a home filled with Torah for all generations to come. We ask Hashem to open our hearts to him that our words should flow forth with gracious and gratitude. Shifchi ka’mayim libech. Yeast is what enables our dough to rise. It represents growth and expansion. When we add the yeast, we should think of each one of our family members and friends and pray that they grow and expand in their emotional, physical, and spiritual wellbeing. We wish for our homes to expand that we may be able to invite guests. We desire for our children to expand their minds with Torah knowledge. Yeast can also represent ga’avah, (haughtiness). We should ask Hashem to expand our good deeds and mitzvoth but not allow our transgressions or negative traits to rise. Yeast also represents rising and we want to rise to our fullest potential. We ask that Hashem help all of us rise to who we are meant to be. The Hebrew word for yeast is, shmarim which comes from the same root as the word, “shemirah,” which means protection. As we add the yeast, we pray for protection for ourselves, our families, and all of the Jewish people. We ask that Hashem should protect us from the yetzer hara and from the ayin hara. Eggs represent the renewal of the lifecycle and the potential of what is about to “hatch.” Eggs are symbolic of fertility. When we add the eggs we pray for life and children. We pray to be able to be the vehicles by which something fruitful and positive can be wrought in the world. Oil represents anointment as it was used to anoint the Jewish kings during ancient times. When adding oil to the dough pour a little at a time “anointing” each one of your loved ones by name and pray for their specific needs. Pray that just as oil makes things soft, our words and actions should be softened. We pray that we should be more flexible and less stubborn in our ways. Just as oil was used to kindle the Menorah, we pray to Hashem that we should merit to see the Kohen Gadol light the Menorah in the Bet Hamikdash be’karov and with rachamim; that we should merit holiness and purity. Sugar represents anything sweet in our lives. We ask Hashem to have the proper faith to be able to view every challenge of life as sweet in our eyes. We pray that Hashem sweetens and harsh judgment or decree; that all our speech should be pleasant and sweet and that the Torah should be as sweet as honey. Salt represents discipline or criticism. It is important to discipline but in smaller measures. When adding the salt pray to Hashem to assist us in disciplining our children in the appropriate fashion. Salt also represents purification. We pray that anything that is toxic in our lives should be removed. Salt is the ingredient used to extract impurities. We pray that we should merit to keep all the halachot of kashrut properly and set correct boundaries for ourselves and family. The Hebrew letters in the salt “melach,” can also represent, “mechilah,” which means forgiveness. We pray to Hashem that all our transgressions should be forgiven and that Hashem should extract any negative influences that were created as a result of our sins. All these ingredient come together and they bring their own important blessings ad they become unified. During the time that we are mixing/kneading the dough we should think about the oneness of Hashem and the oneness of the Jewish people. The time when a woman kneads the dough is a special time (Et Ratzon). We pray for peace in our homes and in Am Yisrael. We ask Hashem to unite us as a nation and to help create togetherness just as all the ingredients come together to form one dough. We pray for unity in the home and a closeness between us and the Creator. Light two candles and dedicate them to two tzadikim (suggestion: tzadikim who’s yahrtzeit falls out on the day you are making the dough).